The new blog, The Saucers That Time Forgot presents "the cases that UFO historians either missed, or would like to keep buried." This piece was originally written for STTF, but since it's not exactly about a saucer case, and is more about UFO history, culture and the media, it's appearing here at BBL. An earlier draft of Ruppelt's notes. General Samford never committed himself one way or the other on the subject of UFO’s. He was always very much interested and gave me the utmost in cooperation, but he never said much. He used to ask many of the other people at meetings what they thought and there were a lot of “pro” answers but he never agreed or disagreed with anyone. The only time that I ever heard him say anything was when Col Porter got real nasty about the whole thing one day and began to knock ATIC, UFO’s, me and everything associated with the project. Then the General said something to the effect that as far as he could see, I was the first person in the history of the Air Force’s investigation that had taken a serious approach to the investigation and that he didn’t see how anyone could decide until I’d collected more data. At the present time the General is the one who is so rabid on the fact that nothing will be released. He got “burned” real bad on the press conference in July 1952. His statements were twisted around and newsreel shots of him were “cut and pieced” to get him saying things that he didn’t. He wanted to play along with the writers but they misquoted him so badly that now he is saying absolutely nothing. Donald Keyhoe keeps writing about the “silence group” in the Air Force, those who want to clamp down on UFO news. Gen Samford is the silence group and friend Keyhoe can take all of the credit for making him that way. No mention of saucers on the cover. 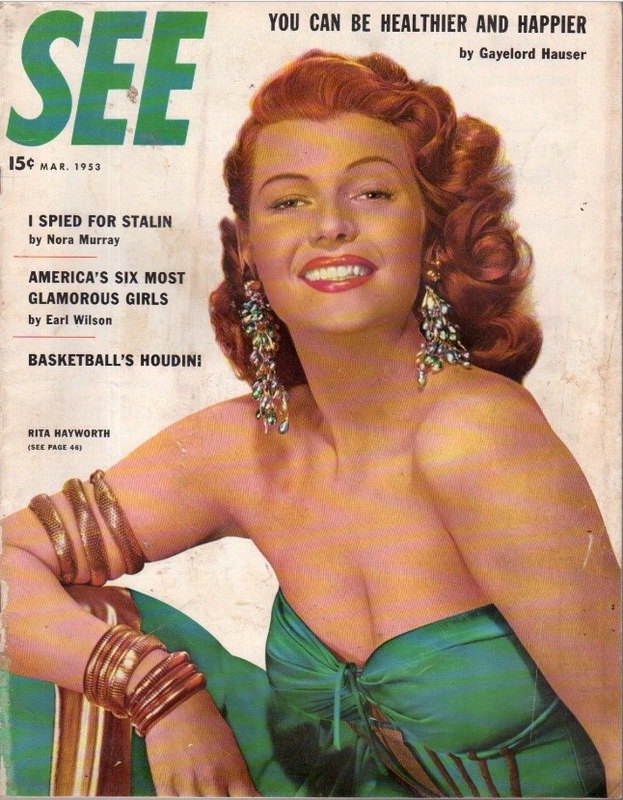 See was a bi-monthly magazine, sort of a more sensational version of Life, but featuring a heavier emphasis on entertainment. See's covers featured beautiful buxom women, making it look more like a girlie pin-up magazine, but they did cover news and current events. 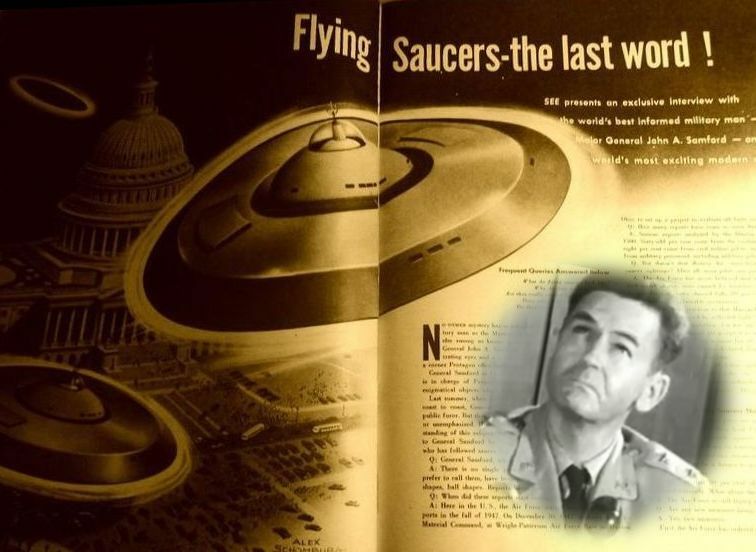 In their last issue for 1952 See made news for its coverage of the flying saucer controversy in an exclusive interview with General Samford of the USAF. NEW YORK -- It is definitely possible that intelligent beings from some other world have been able to visit our planet, or at least to travel within our atmosphere, Major General John A. Samford, Chief of Air Force Intelligence now investigating the Flying Saucer mystery, said today, in an exclusive interview in the current issue of See Magazine, just released. "It would be foolhardy to deny the possibility that higher forms of life exist elsewhere," reported the general just as it would be "unreasonable" to deny that we may already have been visited by beings from outer space. Regarding the, unexplained phenomena, and the possibility of the presence of an alien intelligence, General Samford added, "We believe that all of this eventually will be understood by the human mind, and that it is our job to hasten the understanding." In commenting upon the 20 percent of flying saucer reports which remain mysteriously unexplained, General Samford declared the saucers' behavior indicates they "either have unlimited power or no mass." Many "credible people have seen incredible things," he asserted, "some of which have later been satisfactorily explained, while others so far have defied explanation." General Samford said that the Air Force is keeping nothing from the public regarding Project Flying Saucer. The only information not disclosed is names of those reporting saucer sightings and the method used by Air Force Intelligence to investigate and evaluate these reports. A Harvard professor's theory that flying saucers are caused by reflected light has not yet been proved, General Samford reported. Even if it were true, he stated, "It would not account for all reports, by any means." The general branded as false the rumor that jet pilots have had orders to shoot at saucers. "We have thousands of letters and telegrams begging us to rescind this 'shoot-on-sight order. But no "such order was ever given." 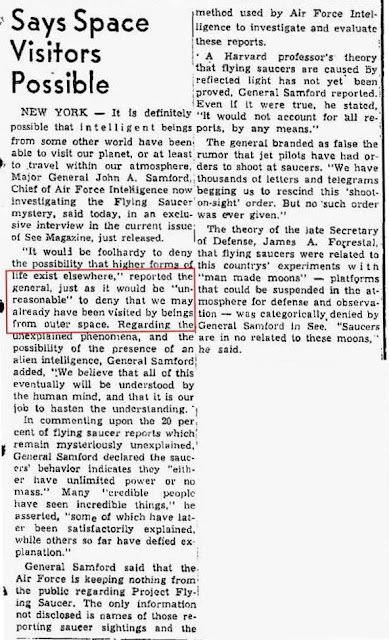 The theory of the late Secretary of Defense, James A. Forrestal, that flying saucers were related to this country's experiments with "man made moons" -- platforms that could be suspended in the atmosphere for defense and observation -- was categorically denied by General Samford. "Saucers are in no way related to these moons," he said. 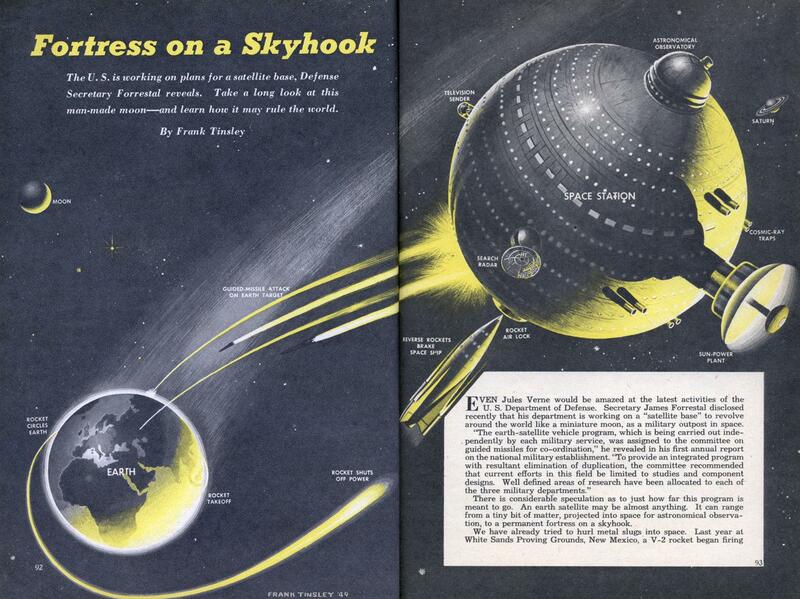 In Loren Gross' UFOs: A History 1952 November—December, he summarizes the same interview from See, but emphasizes different points than the newspaper article. See talks to General Samford. The November issue of See magazine featured an interview with Chief of Air Force Intelligence General John A. Samford by the periodical's Washington editor Serge Fliegers. The General, for the most part, repeated what he said during the big press conference at the end of July. He acknowledged that 25 per cent of UFO reports were made by military personnel, rejected professor Donald Menzel's theories, and insisted that evidence of visitors from space was lacking. Have UFOs been seen over Russia, asked Fliegers? The General replied that the U.S. Air Force didn't know. The Air Force, according to Samford, also lacked satisfactory proof of the supposed "ghost rockets" reported in 1946. Before Flieger left Samford's comer Pentagon office overlooking the Potomac, he questioned the General about the possibility Communist agents were spreading flying saucer reports to put fear into Americans about Russian secret weapons. The General answered: "We cannot discount that possibility. It is under investigation." 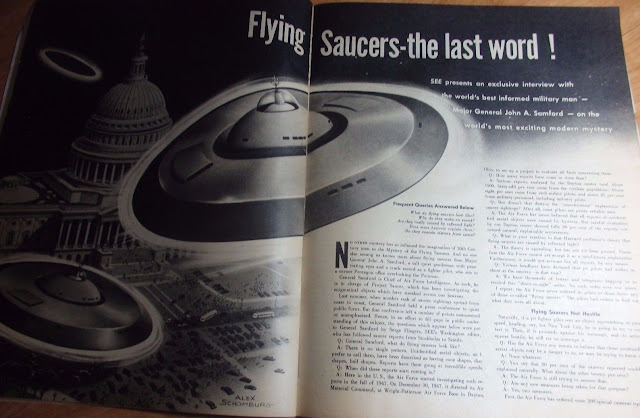 Flying Saucers- the last word! What do flying saucers look like? Why did they make no sound? Are they really caused by reflected light? Does mass hysteria explain them? Do they contain visitors from space? No other mystery has so inflamed the imagination of The 20th century man as the Mystery of the Flying Saucers. And no one else among us knows more about the flying saucer stand Major General John A. Samford, a tall quiet gentleman with penetrating eyes and a crack record as a fighter pilot, who sits in a corner Pentagon office overlooking the Potomac. General Samford is Chief of Air Force Intelligence. As such, he is head of Project Saucer, which has been investigating the enigmatical objects which have streaked across our heavens. Last summer, when another rash of saucer sightings spread from coast to coast, General Samford how they press conference to quiet public furor. But that conference left a number of points on answered or unemphasized. Hence, in an effort to fill the gaps in public understanding of the subject, the questions which appear below were put to General Samford by Serge Fliegers SEE's Washington editor, who has followed saucer report from Stockholm to Seattle. Q: General Samford, what do flying saucers look like? A: There is no single pattern. Unidentified aerial objects, as I prefer to call them, have been described as having cone shapes, disc shapes, ball shapes. Reports have them going and incredible speeds. Q: When did the reports start coming in? A: Here in the U.S., the Air Force started investigating such reports in the fall of 1947. On December 30, 1947, it directed its Air Force Material Command, at Wright-Patterson Air Force Base in Dayton, Ohio to set up a project to evaluate all facts concerning them. Q: How many reports of come in since then? A: Serious reports analyzed by Dayton center total about 1500. Sixty-odd percent come from the civilian population. About eight per cent come from civil airline pilots, and about twenty-five per cent from military personnel, including military pilots. Q: But doesn't that destroyed the "mass hysteria" explanation of saucer signings? After all, most pilots are pretty reliable man. A: The Air Force has never believed that all reports on unidentified aerial objects are caused by hysteria. But careful evaluation by our Dayton center showed fully 80 per cent of the reports concerned natural, explainable occurrences. Q: What is your reaction to that Harvard professor's (Dr. Donald Menzel) theory that flying saucers are caused by reflected light? A: The theory is appealing, but has not yet been proved. Therefore the Air Force cannot yet accept it as a satisfactory explanation. Furthermore, it would not account for all reports, by any means. Q: Violent headlines have declared that jet pilots had orders to shoot at the saucers. Is that true? A: We have thousands of letters and telegrams begging us to resend this "shoot on sight "order. No such order ever was given. I repeat, the Air Force never ordered it to pilots to shoot down any of these so-called "flying saucers." The pilots had orders to find and find out what they were all about. Naturally, if a jet fighter pilot sees an object approaching at great unknown speed, heading, say, for New York City, he is going to try to contact it. Then, if it proceed against his warnings and its actions appear hostile, he will try to intercept it. Q: Has the Air Force any reason to believe that these unidentified aerial objects may be a danger to us, or may be trying to harm us? Q: You say that 80% of the sources reported could be explain naturally. What about the other twenty per cent? A: The Air Force is still trying to answer that. Something Was Not Right. Fake News? 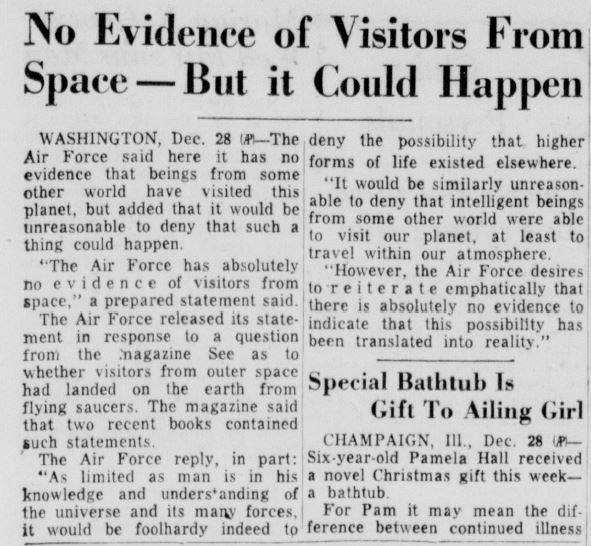 The part about Gen. Samford saying it was unreasonable "to deny that we may already have been visited by beings from outer space" was a pretty spectacular claim to be coming from the United States government. In response to the See article, the Air Force issued a press release to correct the record. We've been unable to locate the document, but have the fragments from it carried in newspaper articles. "As limited as man is in his knowledge and understanding of the universe and its many forces, it would be foolhardy indeed to deny the possibility that higher forms of life existed elsewhere. It would be similarly unreasonable to deny that intelligent beings from some other world were able to visit our planet, at least to travel within our atmosphere. "However, the Air Force desires to reiterate emphatically that there is absolutely no evidence to indicate that this possibility has been translated into reality." "I saw the AP story on it," I said. "But the Air Force is a little sore about that article. (Al) Chop told me they didn't interview General Samford directly—it was supposed to be labeled a hypothetical interview based on public statements he'd made." 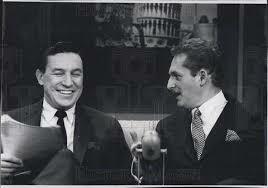 Mike Wallace (L) interviewing Serge Fliegers (R) in 1962. Serge Fliegers was brought up in Switzerland, educated at Cambridge and Harvard. As a correspondent he has traveled in Europe, the Middle East, Latin America, speaks eight languages, including Arabic. Between covering the United Nations for the Inter Continental Press and writing magazine articles, he manages to find time for his special interest- opera and instrumental music. In 1964, Fliegers' name came up during the Warren Commission's investigation into the assassination of President John F. Kennedy. Word got to them that Fliegers claimed that an anti-Khrushchev, pro-Chinese group in the Soviet Union had trained Lee Harvey Oswald to assassinate the President. Investigating the credibility of Fliegers and his sources, investigators contacted Dan Brigham, an editor of the New York Journal American newspaper. Brigham was able to give them Fliegers' location for questioning, and reported that Fliegers was "one of the biggest fakers in the business and anything he says has to be taken with a large grain of salt." When Fliegers was questioned about the source of his assassination information, he said that his source may received this information from another source who, in turn, may have received the information from contacts in Russia. Pressed for the identity of his source Fliegers was evasive and said it was impossible for him to contact him by telephone. The information went nowhere, and turned out to be rumors and speculation repeated by a reporter as if it were facts. Was the See interview an example of what Ed Ruppelt was saying, that Gen. Samford's comments were "cut and pieced” to get him "saying things that he didn’t?" 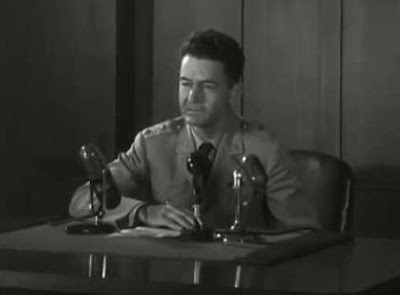 Samford's statements were similar to his remarks from the July 29, 1952 press conference on the Washington, D.C. UFO radar incidents. Saturday Night Uforia has an easily searchable version of the transcript. If the See "interview" had it's origin there, great dramatic license was taken with Samford's words. Maybe after getting burned by Serge Fliegers in See, Gen. Samford set an example for the Air Force, setting the policy that the best way to handle the press on the UFO topic was silence, "saying absolutely nothing." Thanks to The Saucers That Time Forgot's Yvan Defoy for the lead on this article, and to Jan Aldrich for additional details on the AF press release refuting the See article. Secretary James Forrestal disclosed recently that his department is working on a “satellite base” to revolve around the world like a miniature moon, as a military outpost in space. “The earth-satellite vehicle program, which is being carried out independently by each military service, was assigned to the committee on guided missiles for coordination,” he revealed in his first annual report on the national military establishment.